Approaching Glasgow from the south, the green, rolling countryside does not imply the pending city, so much as its ancient name, the Green Valley. Only as we plummet into the Clyde valley itself does Glasgow spring from the ground. Great buildings and soaring spires are piled in close order on the hills to the north. It’s a big city, and the aggressive architecture of the industrial nineteenth century emphatically underlines this. Access by car is easy enough. Once off the ring road, the streets are laid out in a grid. We zig zag our way to the hotel just off Sauchihall Street. The street makes for a good point of orientation. It cuts east west through the city for, well, forever. Chameleon-like, it adopts the hue of all that it passes through. Towards the city centre it’s pedestrianised, a bustling shopping precinct. It’s a bit seedier heading west, where we breakfast at Wetherspoon’s – Full Scottish with Haggis – and ponder the possibilities of a host of Curry Houses. Passing the ring road we’re in the more salubrious West End with grand terraces, parkland and mature trees. Sauntering east down Sauchihall Street towards the city centre we join a growing river of humanity. At each intersection streets head uphill and down, distances dotted with landmark spires and turrets. It’s bright and brisk as evening approaches, but we find there’s not much doing here after dark. At Buchanan Street we take a right angle. 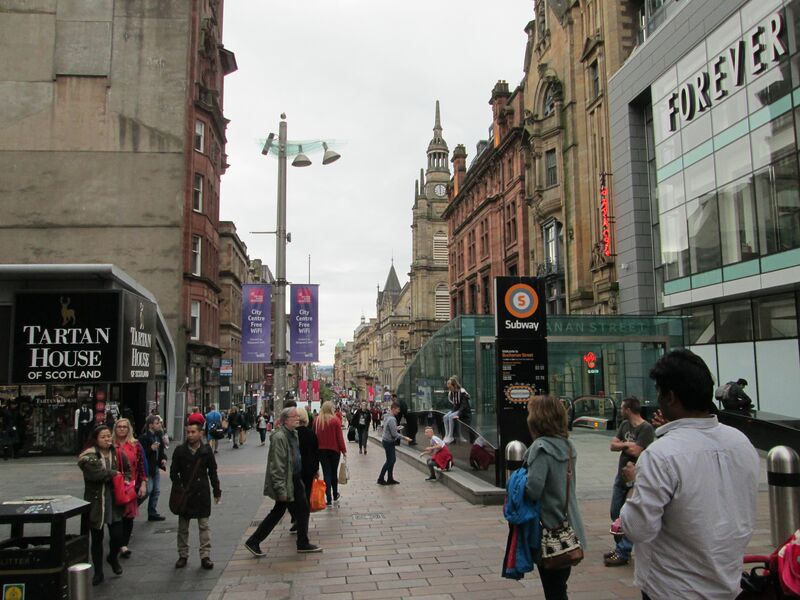 Sloping down towards the Clyde, Buchanan Street is lined with imposing commercial palaces. Above the pediment, spires and statuary sharpen the skyline. Soft yellow sandstone builds strong, impressive facedes, blood red sandstone breeds angels from the architecture. This town was built on muscle and blood. Tobacco, cotton and slavery saw its port prosper in the eighteenth century. It was a gateway to the new world, in both directions. The Scottish Enlightenment forged its own genius, taking the city to new heights. 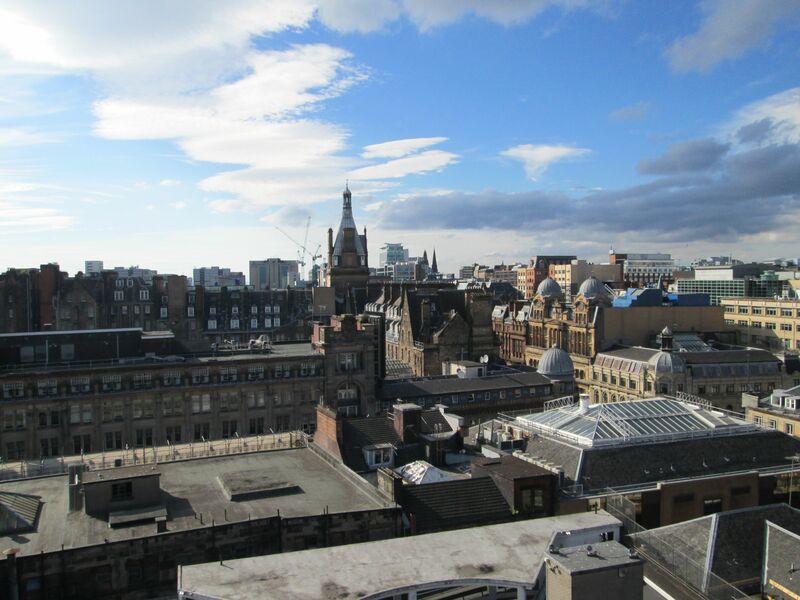 After the Industrial Revolution, Glasgow became a European leader in industry and engineering, particularly as a centre of shipbuilding. I hadn’t realised Glasgow would be so hilly. The grid system accentuates this effect. If not quite San Francisco, it was reminiscent of Seattle, all that commercial power beneath the pale, active northern sky. There’s more than a twist of the Gothic going on here. Superheroes would be right at home amongst its architecture, villains too. If picturesque Edinburgh harboured Superman, Glasgow would have The Batman. At the salubrious end of Sauchihall Street, the Kelvingrove is situated in parkland around the Kelvin River. The river’s name was appropriated for Baron Kelvin, the famous Irish physicist William Thomson, who worked from the University of Glasgow overlooking the valley. Coming to Scotland, it’s faintly humourous that he figured how low temperatures can go. 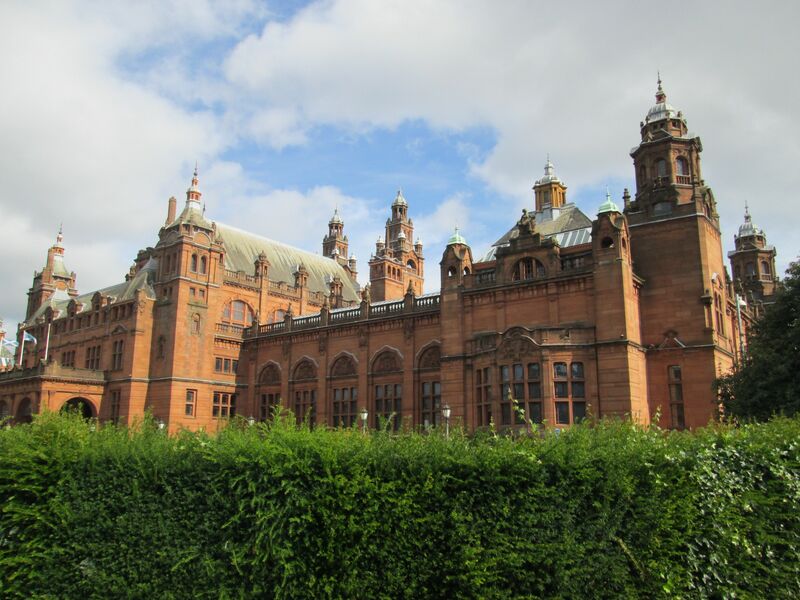 The Kelvingrove Museum was completed at the start of the twentieth century. It is an impressive, pink-hued Baroque temple, housing a fine collection of international and Scottish art. Orientation was initially difficult, the museum map is a mirror image of what it should be. But Glasgow’s a bit like that, I suppose. 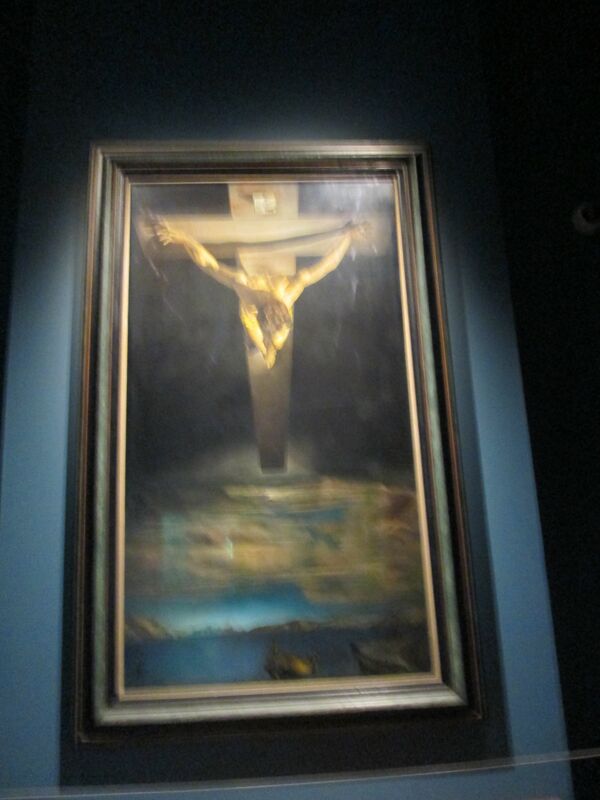 Salvador Dali’s most coherent masterpiece, Christ of Saint John of the Cross, is its outstanding work. Glasgow might seem a curious repository for such a determinedly Catholic work. Indeed, the painting has suffered the attentions of a slasher, his handywork a palimpsest beneath the restoration. Still, the painting exudes an awesome serenity. It is the epitome of suspension, combining crucifixion and resurrection, appropriately enough for this city. Nearby, another startling Catholic artwork illuminates the shadow. Harry Clark’s Coronation of the Blessed Virgin was commissioned for a nearby convent in 1923. It is a fine example of Clarke’s meticulous, flowing art. It makes a most appropriate companion-piece to the Dali. The gallery also houses paintings by Rembrandt, Van Gogh and Renoir. The ground floor houses an eclectic and dynamic exhibition, including an Elephant and a Spitfire. 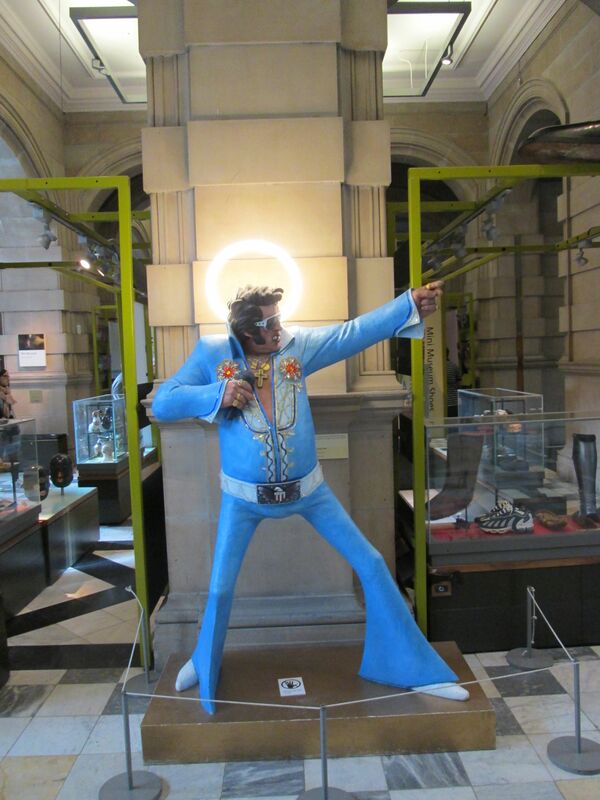 A haloed Elvis points the way. The main concourse is dominated by the classical pipe organ, booming into life at lunchtime when there is a regular recital. It’s a hot climb through lovely parkland to the University of Glasgow atop Gilmore Hill. Its majestic spire is an ever distant destination, dominating the city from it lofty eyrie. We ghost through the quads and cloisters, seek out the Hunterian Museum where the interior of the house of Charles Rennie Mackintosh (1868 – 1928) is recreated. It is held within the silo of the Library and Art Gallery complex across from the main building. There is something Tardis like in exploring the interior of a house that no longer exists. Mackintosh was neglected in his late career, and for a while since, but his reputation is now universally established. Though I fancied a stroll to Byers Road for some drinking and dining pleasure, time was tight and we had to move on. We take a bus through the West End, which is pleasantly alive with drinking and dining possibilities. We can only window shop from the bus, we will return another time. Our quest for all things Mackintosh leads us back to the city centre. Mackintosh’s design is a pervasive strand throughout Glasgow, though scarce enough unless you know where to look. His work was an influence on Klimt and others in European Art Nouveau. Time has to be made for tea and coffee too. Tea Rooms were an intrinsic part of Glasgow life in the late Victorian age. A surge in Temperance was a motivating factor. Miss Cranston was a key figure in the business and she commissioned Mackintosh to design her Willow Tearooms on Sauchihall Street and Buchanan Street. He imbued them with that typical Art Nouveau merger of modern glass and steel craft with the exotic aesthetic of the Orient. Such places, whilst bolstering clean living on the one hand, were meant to be seductive. 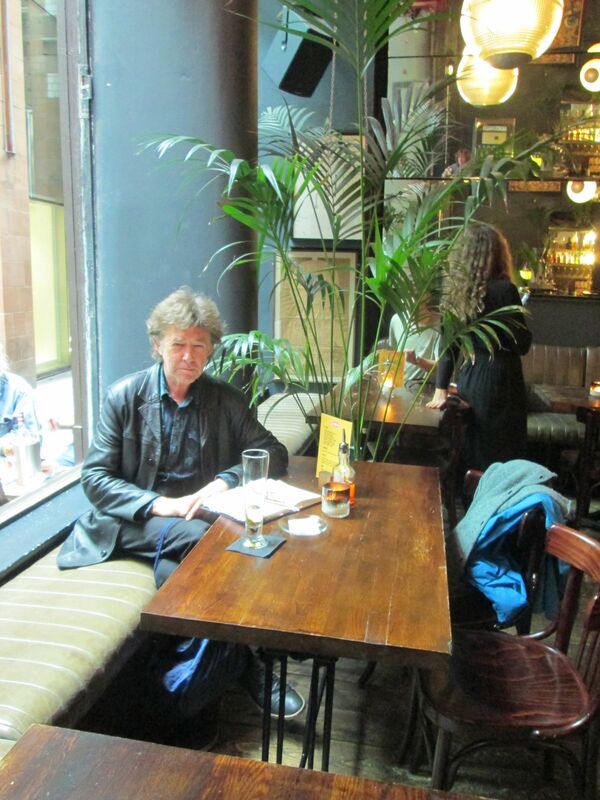 Coffee remains a favourite tipple in Glasgow today, but amongst other things. There’s a good arthouse feel to many of the cafes. Mind you, Glasgow’s friendly reputation took a dent in one. As I lounged with a stray arm draped over a nearby chair, a customer whipped it from under me without a by-your-leave. Somewhat harshed me buzz, that. The Lighthouse, focus for all things Mack, stands sentinel on Mitchell Street. Its corner tower results in the nickname. At night, a faint light blinks from its upper storey, the beacon of a lighthouse that isn’t, aground in the metropolis. 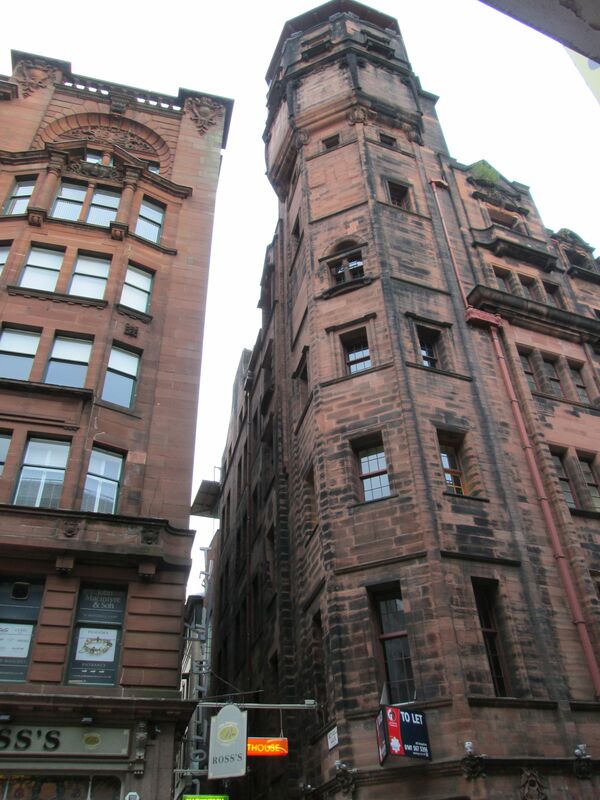 It was designed for the Herald newspaper, and was Mackintosh’s first public commission. It’s just off Buchanan Street, by way of narrow Mitchell Lane. The approach is suitably gothic. The Lighthouse gives a comprehensive view of his career. The interior of Mrs Cranston’s Tea Room is recreated. There are models and drawings of his architectural work, a sad timeline delineating his fading career. 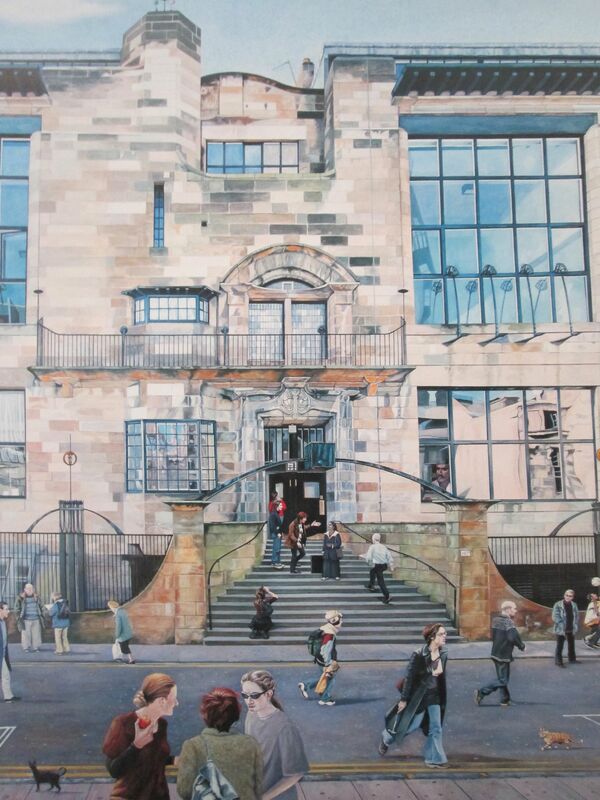 There is a graphic depiction of the School of Art, his most famous architectural work. The original stands on Renfrew Street, just about. Seriously damaged by fire in 2014, it is undergoing extensive reconstruction and is clad in scaffolding when we visit. I’m envious of this building, my own Art College days having been spent in a dilapidated annex of Leinster House, a disused warehouse and the early days of the refurbishment of Power’s Distillery, now a fine home for Ireland’s National College. I’m familiar with scaffolding and art college. 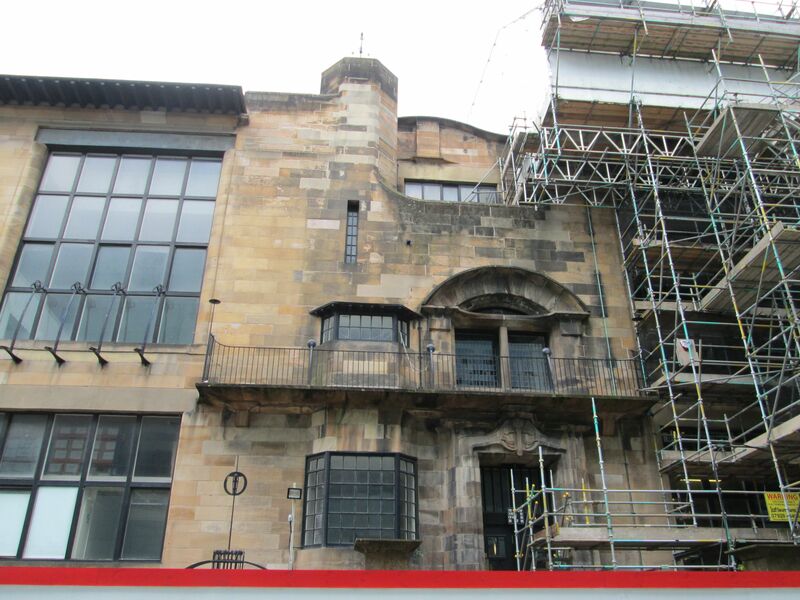 Glasgow has had this purpose built masterpiece since 1909, it is a testament to the city, and its creator, Mackintosh. We finish by doing what one must in a Lighthouse. 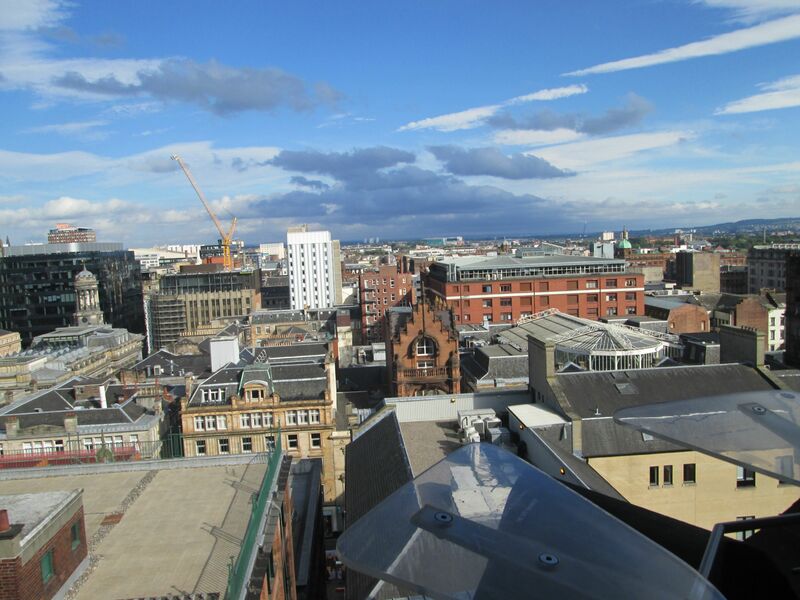 We climb the spiral staircase to the top, where there are magnificent views over Glasgow’s rooftops. Back to the more claustrophobic confines of Mitchell Lane. Good place for a pint, and there are good eateries nearby, for later. For now, time to absorb the September heat sitting half outdoors in the gleam and gloom of the atmospheric lane. The Lighthouse looms above. There’s a feeling here of being on a faultline between past and present, of inhabiting a graphic novel with grainy realism just a squint away. That’s draping the cloak of Glasgow around you. That’s being The Batman.